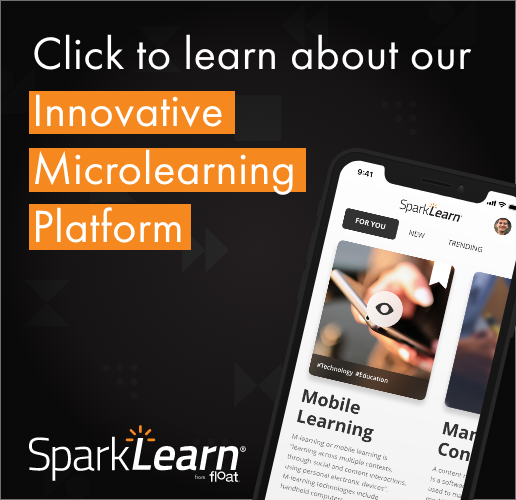 Your initial foray into mobile learning doesn’t need to be complicated, require a five figure budget to implement or dramatically alter how your company conducts learning. The great thing about mLearning is that it encompasses so many forms of knowledge transfer and sharing that there are many creative implementations, all of which fit neatly into the category of mobile learning. This month’s newsletter presents seven easy and relatively low-cost (in some cases free) ways to implement mobile learning. The hope is that these will not only be useful but will also help to trigger other ideas that can be implemented and shared. Microbloging is a web-based service that involves the sending or broadcasting of short messages to a specific group of individuals who are signed up or have “subscribed” to be a part of that group. Twitter and Yammerare examples of two popular microblogging services with the former being free yet public, and latter offering paid subscriptions to set up a private group. Both services are easily accessed on mobile devices making them available wherever a cellular or Wi-Fi connection is available.Microblogging works great as a simple messaging and collaboration tool. For instance, a salesperson could send out a message to his or her colleagues such as, “Getting a lot of pushback on our recent price increases. Anyone have a suggestion on a response?” Others who see the message can easily weigh in on the conversation. Because these services work with SMS, virtually any mobile phone user can have access to this information and participate in the conversations. For a good overview of microblogging, check out the Wikipedia article on the subject: http://en.wikipedia.org/wiki/Microblogging. WordPress is an open source publishing platform for the web. It was started in 2003 as a blogging tool but has since matured into a very robust content management system. Because it is open source, it is free to download and use. From a technical standpoint, all that is needed is a web server running PHP and MySQL. What makes WordPress so useful for mLearning is a plugin called WordPress Mobile Edition. This plugin automatically creates a mobile-friendly user interface when someone launches the site from a mobile device.With WordPress and the Mobile Edition plugin, websites can easily be created that serve as handy reference material for people on the go. For example, a list of a company’s safety rules and regulations could easily be documented using WordPress. When workers on a jobsite need access to those rules and regulations, they can easily pull up the site and search for the information they need. The About section of the WordPress site has plenty of additional information: http://wordpress.org/about/. While someone often will read a recipe in a cookbook or magazine, think how much more powerful it is to watch a chef demonstrate how to make a particular dish on TV. There are many situations where video can be used as an excellent learning tool. In instances where being able to visualize a task or view a series of steps is easier and more efficient than a text description or static photos, videos can work extremely well. Creating a YouTube Channel provides a way to organize videos that are created for a specific purpose or company. YouTube videos play on many of today’s mobile devices making this a great site to put mobile content. There is one drawback; YouTube Channels cannot be made private so content that needs to be kept exclusive to a company or organization, YouTube would not be an viable solution. However, there are a number of other video sharing sites that do offer the ability to privately share videos with individuals or groups.One particular service, Wistia, is interesting for mobile learning because Wistia not only tracks who watches each video being served, but also how much of an individual video is viewed and how many times it is viewed providing excellent usage metrics. Wistia is not free, but currently prices start at $39 per month for basic video hosting. Today, virtually 100% of all mobile phones have the ability to send and receive text messages. This capability, along with a relatively low overhead cost, makes text messaging an ideal way to distribute bite-sized learning nuggets. There are numerous examples of how text messaging can assist in the mobile learning arena. One example is reminders for a group or team. Imagine a safety manager on a construction site. At 5am he notices the weather forecast for the day is hot and humid. So using a service to send SMS messages to a group of people, he sends a reminder to all the members of his crew, “Forecast for today is hot and humid. Don’t forget to bring adequate sun protection (hat, sun block, etc.) and extra water.” In sending a message that costs his company around 5 cents or less, he may end up preventing a worker getting heat exhaustion, heat stroke, or something worse. Another example of SMS usage in a corporate setting is in the on-boarding of personnel. In this situation, text messages can be scheduled to be sent over the first week or month of a person’s employment. The messages can be anything from a reminder to complete specific paperwork to providing additional information about the company that may not have been presented during the initial orientation. This type of on-boarding can create a connection that eventually leads to a more engaged (read productive) employee.There are a number of text messaging services that offer a variety of ways to send text messages. Some, such as Penny SMS, provide ways to send text messages to groups through email, or by writing your own application and using their dedicated API. Other systems let you pre-schedule text messages to be sent at a future date. It is generally not recommended to simply convert a PowerPoint presentation to something that can be viewed on a mobile phone and call it mLearning. There are many instances where this would be wholly ineffective – who wants to look at a 2 hour, 150 slide presentation on a company’s strategic initiatives on their iPhone? However, there are other instances where a PowerPoint specifically designed for presentation on a mobile device can make sense. Reference documents are a great example. Think of information like product data, tip sheets, or quick reference guides as information that could be made available on a mobile device through the conversion of a PowerPoint document.There are a number of ways to make a PowerPoint mobile ready. The methods that are most appropriate depend on whether the document needs to be resident on the phone so that it can be accessed when the phone is not connected and the types of phones used by the target audience. One option is to use SlideShare. SlideShare has a mobile version that works on the iPhone and Android operating systems. Another option is to create a video of the PowerPoint presentation. This method has the added benefit of being able to easily handle audio narration. The video can then be published to YouTube or downloaded directly to a mobile device. One option for this is to use AuthorStream to create a video version of your PowerPoint. Creating videos with an AuthorStream watermark are free, if you want videos without the watermark, there is a fee. Click here for a tutorial on how to create a video (with audio) of your PowerPoint. Podcasts can be a great form of mobile learning because of their flexibility. Whether mowing the grass, driving to work or waiting at the airport, audio podcasts are a great way to communicate information or share knowledge because it uses one sense: hearing. Depending on the content and the type of information being shared, this allows the learner to be engaged in other activities while learning. Obviously, audio podcasting is not an effective approach to mobile learning in all cases. Certainly, situations that involve visualization or learner interactivity are not appropriate. But audio podcasts work very well when presenting information to an interested audience and when engaging storytelling can be incorporated into the content.There are a number of free tools available for creating audio podcasts and some excellent step-by-step tutorials available as well. The basic steps involve creating the audio file, converting to the correct format and publishing the podcast. Here is one such tutorial from Cnet reviews. Poll Everywhere is a web-based audience response service that allows a presenter or trainer to ask a question and receive audience feedback via SMS Text Messages or Twitter or the web. Responses can then be displayed real-time in PowerPoint, Keynote or on a web page. The advantages of Poll Everywhere are 1) that it is easy and 2) it is relatively inexpensive (or even free!) depending on the size of the audience you wish to poll. Polling during a presentation is an excellent way to engage your audience, gather feedback and allow them to participate in the discussion. Give it a try! A word of caution when reading this newsletter. The title is Seven Easy and Inexpensive Ways to Implement Mobile Learning (note the emphasis on implement). Just because something is easy and inexpensive does not necessarily make it the right tool for the job. One can easily go to the local Wal-Mart or Target and purchase a child’s wagon for a relatively low cost. But if you try to use it to haul 5 tons of rock from the landscaping company across town, you will find your wagon is not very effective. However, borrowing your neighbor’s pickup truck may be equally easy and cost you nothing more than a beer or a gift card to a local restaurant. The point is, no matter how easy and inexpensive something is, you still have to select the right tool for the job, or in the case of mobile learning, the right design to meet the learning objective. The seven ideas presented here can all be effective in certain situations and not at all effective in other situations. When implementing mLearning be sure to think of the context goals of the learner to make sure they are using the right tool for the job. 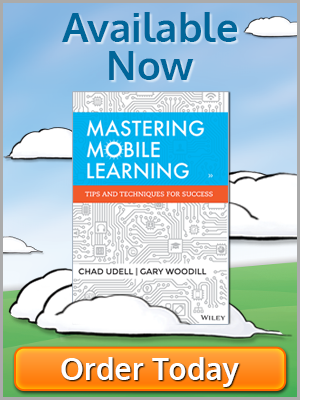 What easy and expensive ways have you used or know of to implement mobile learning? Leave a reply and share your thoughts. To output PowerPoint as video, I recommend to use PowerPoint 2010 (http://office.microsoft.com/en-us/powerpoint/ ) or Moyea PPT to Video Converter (http://www.dvd-ppt-slideshow.com/ppt-to-video/ ) for in these two ways all the PowerPoint originals like animations, slide transitions, music will be preserved.